So you still have a stat issue even after all the efforts we put into fixing it for good ? Ok let's find out what is going on. In all cases, make sure you don't have any buff or any hidden bonus like tributes. tekknolai, I am happy to report that all your stats looks fine to me now ! Your mana is off by 250 but I believe you have a tribute bonus of some kind. Is your Wis ingame 1022 ? Well if you are sure you have no tribute at all, let's continue this discussion over the topic below. Thanks ! think the ATK for Rangers is low, see some ppl with low atk in the Ranking, myself have 3143 in game without buffs, but only 2517 in magelo. 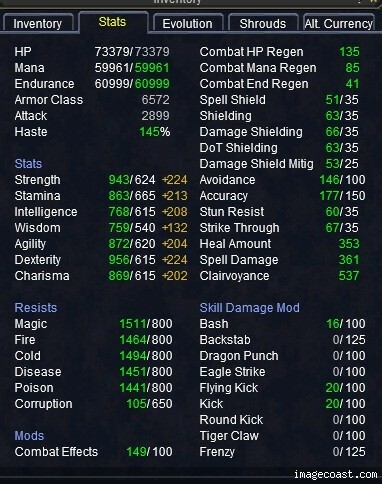 Ariusz on the rathe ( http://eq.magelo.com/profile/1410300') my ATK is 4962 in game and 2549 in profile. Looks like I have fixed somewhat the ATK for rangers.Vmas, can you please confirm that your ATK ingame is still 3143 ? Which would mean that somehow we have +11 pts... but at least much better than before. As for your monk acpayne, there is still a little mystery as that point. I would like to see a report from a monk who has an authentic profile just to make sure that we have all the AAs. By the way, one think you should try acpayne, is to sync your id card and see if it makes any difference at all. Thanks for your reports so far guys and tekknolai, I am not forgetting the mana issue, will take another look fairly soon. Ha, that's good news ! Thanks Vmas ! I re-synced today and it looks like it is working ok. Ingame it says 2962 and now in magelo it says 2962 instead of 2549. Before it was not registering any of the atk stats from the armour. Ha fantastic news acpayne ! I dont think the issue has to do with your items, much more likely your AAs. I am not recording additional info for each AA which allows me to compute the contribution of those AA toward stats like ATK. And so in your case, nobody had contributed the AA at the rank you are before hence the calculation being off. tekknolai, thanks for this info, but it shouldn't be a problem has Magelo Sync get your starting stat as they are ingame so we should be ok on that front. Today, I happened to notice a rather large discrepancy with the amount of ATK modifiers displayed on my warrior's profile. After doing some additional poking around, its seems that ATK, HP Regen, Mana Regen are not being totalled properly on any of the character profiles listed in my signature. For example, on Valikk, the only ATK values being recognized "from items" are those from the 8 visible armor slots (the Glorious armor) – and even those values are incorrect. The ATK values from the remaining 17 armor slots are neither being recognized nor summed on the ATK button on the General Tab of the Modifiers view. Similarly, on Tobynn, the total ATK "from items" shows as only 54. My earrings alone surpass 54 attack. Again here, most of the slots are not being counted. As mentioned above, additional missing values can be found not only with ATK, but also with HP regen and Mana regen. Hello, I just noticed that after updating my characters via MageloSync, the Ilvl is not the same as reported on the ingame chracter sheet. There is a different way for calculation of the ilvl or it is not updating properly? My main has avarage ilvl 395 and my other 2 85's have avarage Ilvl highter than 380, but all my 3 characters aren't above ilvl 330 in the signature. Hi khoinoor, could you please post your report in the Magelo WoW bugs forum, as this forum is only for EverQuest issues. Thank you! EDIT: I just tried taking off buffs again, and suddenly my in-game HP matches the Magelo figure. I have no idea what has changed. I don't think you have a bug, but can anyone suggest a reason for the 400hp difference I was seeing yesterday? This is probably something i am doing wrong... last time it was because of the bump from group leader boost... but I am not grouped, all tribute is off, and I have no buffs. I've never tried uploading images before, if this does not work I hope I can edit to figure out how to make it do so. Anyway, if I can get the links to work you can see that there is a significant discrepancy in HP Mana, endurance... and a small one in AC. Yet every individual item I check seems to be correct.